The Heat Pump is now recognised as the most environmentally friendly method of heating. Hydro-Pro is a popular Heat Pump all across Europe with hundreds of happy customers each year. If you consider an average gas boiler is only ever 85 to 90 % energy efficient. A Hydro-Pro Heat Pump will deliver 350% efficiency when the air temperature is above 10 degrees. If the air temperature reaches 25 degrees this goes up to a massive 500%. So for every £1 you spend on running the heat pump (electricity) you will gain £5 worth of heat. You will be getting free heat from the air! If you need a hand checking which size heat pump best suits your sized pool, please contact us. We are happy to help. A number small of factors may effect the choice. 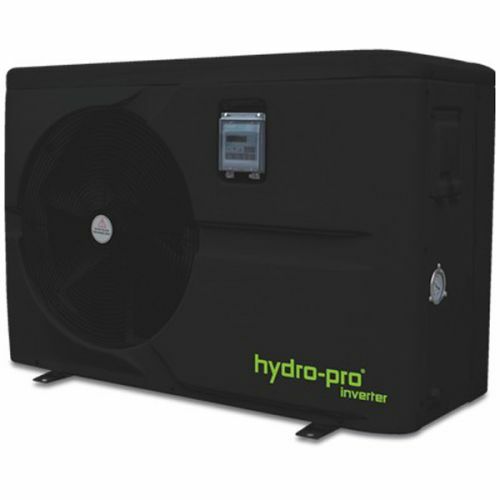 The Hydro-Pro Inverter sizing charts as base on the following assumption, the entire pool is in the ground, ground water level is below pool construction, average water depth is 1.3m and a heat retention cover is used for 20hrs a day. If your pool is in a very exposed location please tell use as this may have a small bearing too. Please contact us if you are not sure, we will help specify the correct unit. These Heat Pumps are available in Single and Three Phase Electrical Options. The Inverter Technology allows for a soft start, so no voltage peaks. If in doubt please contact us or download the electrical specification which in the installation manual and available to download from our Resources Tab above. All heat pumps will heat indoor and outdoor pools, but remember indoor pools tend to be used all year where as most outdoor pools use in the warmer months. All Hydro-Pro Inverter heat pumps are sold in the UK come with a comprehensive 2 years warranty. Hydro-Pro have a network of approved engineers at various locations around the country. The warranty procedure is very straight forward although seldom used! If you contact us we will offer you advice based on a deep understanding of Swimming Pool Heating and factors that effect it. We have been specifying and installing all makes of Swimming Pool Heat Pumps for many years. More Information available to download from the Resources Tab above.